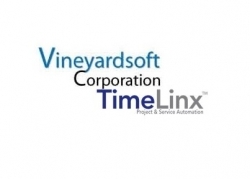 North Andover, MA, March 04, 2019 --(PR.com)-- TimeLinx, a leading project and service management platform for the mid-market, today announced it is expanding its technology partnership with Vineyardsoft Corporation, the publishers of KnowledgeSync. KnowledgeSync is an industry-standard alerting and workflow engine. It already powers the TimeLinx AlertPak, which today bundles 24 alerts into one affordable package. TimeLinx and Vineyardsoft go to market through mid-market business partners, resellers and consultants. The two companies are dominant in that market segment with key mid-market ERP and CRM publishers, including Sage, Infor and Intuit. Vineyardsoft is the developer of the acclaimed KnowledgeSync alerts and workflow application. It monitors activities within other applications and notifies users of noncompliance. With more than 1 million users worldwide, KnowledgeSync is key to many platform implementations such as Sage and Infor. Founded in 1998, Vineyardsoft is headquartered near Boston, MA. TimeLinx, a leading project and service management platform for the mid-market, today announced it is expanding its technology partnership with Vineyardsoft Corporation, the publishers of KnowledgeSync.